How do you deal with the waste accumulated at your home or office without spending much money, or having to invest any effort of your own? By using our specialised junk removals in Hillingdon, of course! We specialise in all types of residential and commercial property clearances and will have your premises junk-free in a matter of hours, and without charging you silly money for it either! Our property clearances are performed by teams of specially qualified waste management technicians who will handle the job in a diligent, well organised fashion. Our crews are safe, efficient and punctual – there will be no cutting corners or any costly delays. We operate a fleet of purpose-built waste removal vehicles of variable size and load capacity – this means we can load and haul away large amounts of waste in one go thus making our junk removals in Hillingdon an efficient and swift alternative to expensive and slow skip hire through council or private contractors. We work in strict accordance to all applicable health and safety regulations, we recycle all electronics and electrics as per the rules of the WEEE program. General household waste, garage and shed junk, basement and attic rubbish, garden waste appliances, household electronics etc. All types of office waste like old paperwork and files, filing cabinets, redundant electronics and office equipment like furniture, workstations, water coolers etc. Most types of retailer and manufacturing waste like packaging materials, leftover manufacturing and building supplies, machinery and equipment etc. Please consult with us on the items and materials considered hazardous waste as those will not be subject to collection. Junk removals in Hillingdon are booked for all days of the week, including public holidays at no change of price, and under flexible hours. We know from experience how hard it is to find a company that rents out skips at affordable prices and this is why we have decided to spare our clients the trouble and provide them the finest possible skip hire services. We have a large range of skips (from 2 yards to 14 yards) that we rent out at highly reasonable prices which are fair to both parties. You can use our skips for the collection of all types of rubbish. Also don’t worry if your waste emits a nasty odor because we provide covered skips as well. Alternatively, customers can also turn to us for additional services like full house or office clearances, or organise a fixed schedule removal and disposal service. Households and commercial establishments in Hillingdon will be supplied with individually prepared quotes, and flexible pricing without any hidden fees. When dealing with large amounts of rubbish, we recommend requesting a free viewing / onsite quotation. Customers only pay for junk actually removed. We are a licensed service provider and ensure responsible means of waste disposal. Recyclable waste is separated from general waste and deposited at respective treatment depots for further processing. All work done by qualified and trained waste removal technicians. Junk and rubbish collected from anywhere on the property including tricky spots like attics, basements etc. The London Borough of Hillingdon occupies the western boundary of Greater London. In surface area, Hillingdon is the second largest of the thirty three boroughs of the capital. 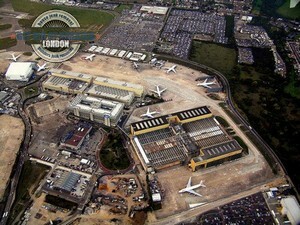 Perhaps the main place of interest in Hillingdon is London’s Heathrow Airport. Figuratively, the borough is split into South Hillingdon and North Hillingdon. The south of the borough had strong industry and manufacturing up to the nineteen eighties when industry gave way to housing developments. The northern half has always been typical London suburbia with mostly residential properties. Like much of London, Hillingdon too expanded and developed with the arrival of the railways. Currently, much of Hillingdon is within London’s Metropolitan Greenbelt and the local council is responsible for looking after two hundred parks and green open spaces, with a total surface area of seven hundred and thirty hectares. The Colne Valley Regional Park is perhaps the most famous park in the London Borough of Hillingdon. The park is named after the nearby Colne River and spreads over an area of 43 square miles. The Norman Leddy Memorial Gardens are another well-known open space within the borough. Hillingdon borough forms the western boundary of Greater London, and happens to be the second largest of the thirty two boroughs, home to two hundred and seventy five thousand people. Hillingdon was formed in the nineteen sixties by a merger of several former regions of the capital. Hillingdon Council, the governing body of the borough resides at the Civic Centre in Uxbridge – one of the major commercial and metropolitan centres within the borough. The early twentieth century expansion of the Metropolitan Line, also brought urban development to the borough, making it a part of London’s so called Metro-land.